For these three shows, I was specifically invited to exhibit my new topical and political work. That feels affirming, since breaking out of my comfort zone to tackle real world issues has been unsettling at times. 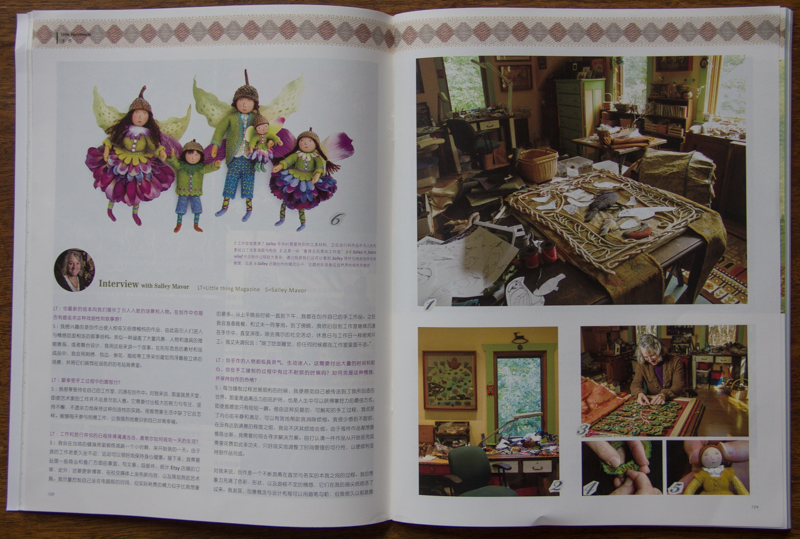 And I’m excited that my work is being recognized outside of the fiber art world. I think that in order for fiber art to be taken seriously in the larger art world, it needs to hold its own when viewed side-by-side with other kinds of art. Opportunities to do this are limited, so I’m thankful for the chance to exhibit my work along with a variety of mediums, sometimes as the only fiber artist. That is also the case in the illustration world, where the majority are painters or computer artists. In this broader context, I am viewed as a visual communicator who just happens to use a needle and thread to say something. But one can’t ignore the unique visceral connection to techniques and materials that fiber art offers. I know that stitching is an integral part of my experience of making art, as well as how others perceive it. How one makes art is an important part of the symbiotic relationship between message and medium. In a simple sense, the creative process comes down to individual marks or gestures that add up to something whole, whether it be with brush strokes, body moves, musical notes, typed letters or stitches. Liberty and Justice; The Sweet to Satirical Art of Salley Mavor is moving back home to Cape Cod after its successful run at the New England Quilt Museum. My work will also be shown in two curated thematic exhibits – Migration in Warren, RI and The Art of Cute in Kennebunk, ME. The amazing sculptor, Harriet Diamond and I are featured artists in Migration, a show about migration, refugees and displaced peoples. The Art of Cute takes a serious look at a powerful aesthetic that is often not taken seriously. My works will be examples of how how cute, combined with other aesthetics, can create meaningful art that is ironic, disturbing, political, joyous, humorous and provocative. 18 enlarged photographs from the Wee Folk Players series of satirical cartoons (including the doll house set), 13 minute stop-motion animated film – Liberty and Justice: A Cautionary Tale in the Land of the Free, Display of 3-dimensional characters, props and scenery from the animated film, A collection of earlier work from “the innocent years” – children’s book illustrations, Self Portrait: A Personal History of Fashion , Rabbitat and Birds of Beebe Woods. The Art Of Cute takes a serious look at a powerful aesthetic that is often not taken seriously. The exhibit is organized into three sections: Normative Cute, Applied Cute and Meta Cute and will explore why we are drawn to that which is cute and how its impact is felt in life, in design and in art. A selection of Salley Mavor’s topical and political work will be displayed in the Meta Cute or “beyond” cute category. This part of the exhibit explores how cute, combined with other aesthetics, can create meaningful art that is ironic, disturbing, political, joyous humorous and provocative. 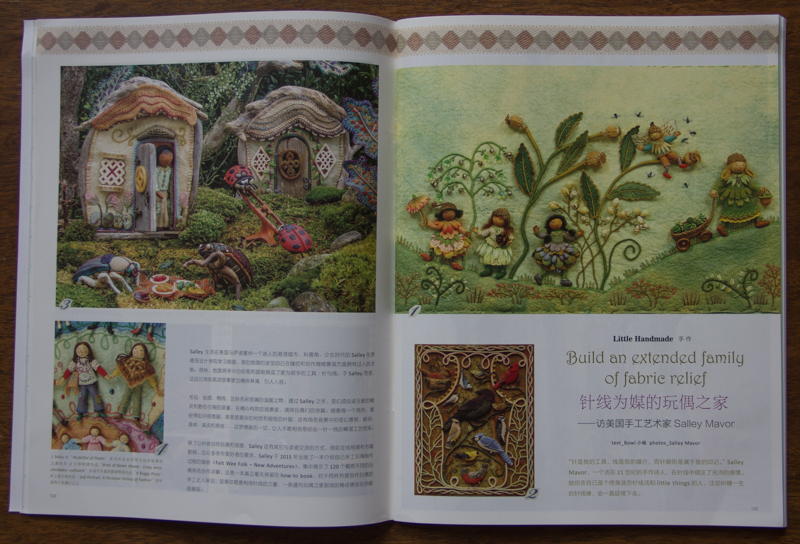 I was excited to receive a copy of Little Thing Magazine, a style and fashion quarterly, which includes an article about my work. 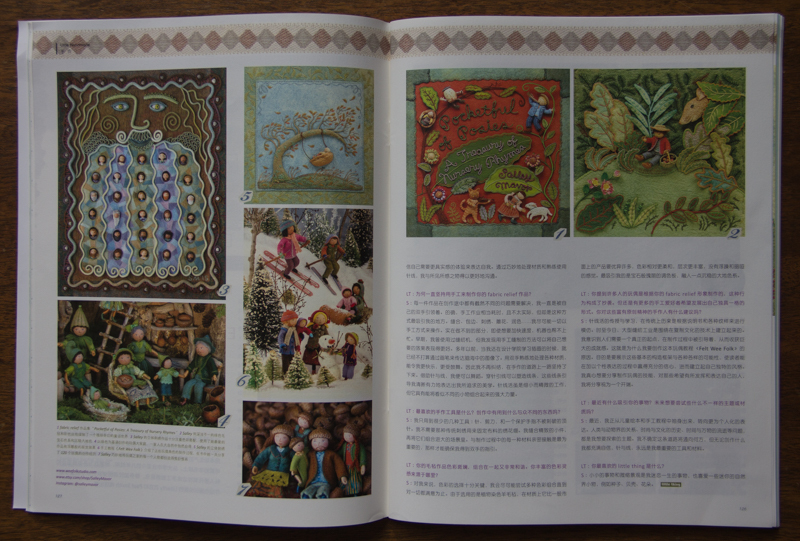 It’s printed in Chinese, with a smattering of English headings, but I think most people will just look at the pictures. The winter issue’s theme is Girls Love Illustration and features a dozen interviews with illustrators from around the world. The magazine is girly for sure, but not in a too cutesy. Its editors do a good job of gathering a sophisticated collection of “beautiful things” to pour over. I’m not sure who it’s aimed at, but there’s definitely a youthful, playful spirit that many people (besides teenage girls) can appreciate. 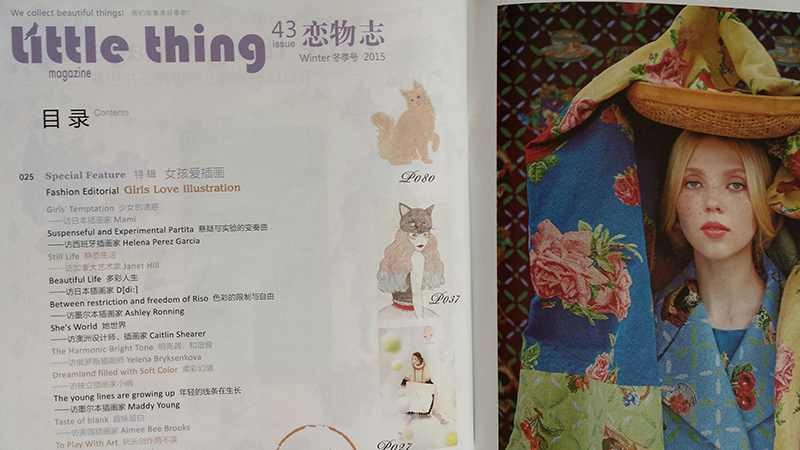 All that said, I find it peculiar that a publication out of Hong Kong would be so devoid of Asian influence. It oozes European style and the fashion pages show only models that look like they’re straight out of Scandinavian central casting. 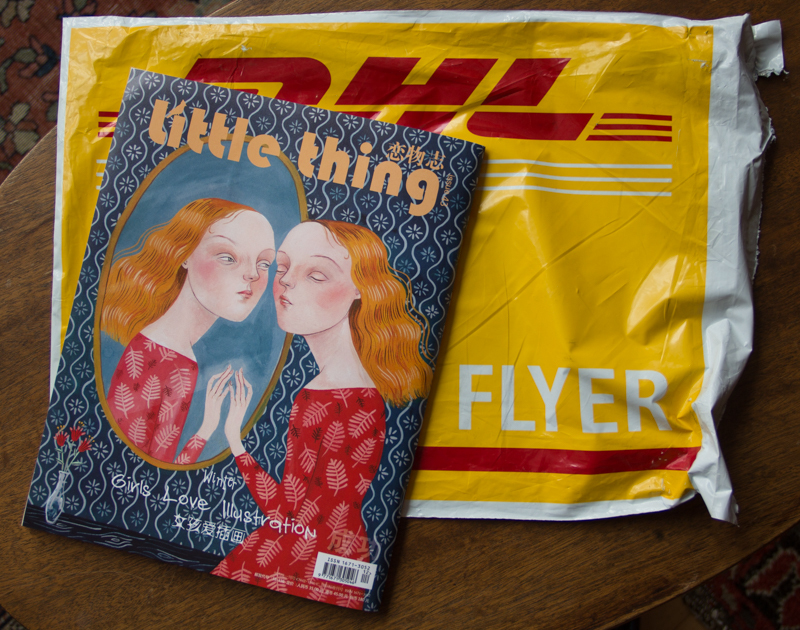 Besides being perplexed by this incongruity, Little Thing Magazine is chock full of inspiring images and I’m grateful that they reached out to me! Incidentally, a couple of years ago, the magazine featured my friend Mimi Kirchner’s tattooed dolls, which she writes about here.